A Worcestershire woman whose twin girls were stillborn after "warning signs" of medical problems were missed has won compensation from an NHS trust. Stella Bate, 34, said Worcestershire Royal Hospital did not carry out an early pregnancy scan which may have picked up their medical condition. 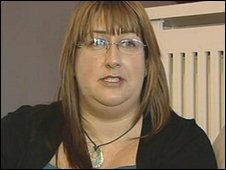 Her solicitor said it missed "warning signs" in 2005 that her babies had Twin-to-Twin Transfusion Syndrome. Worcestershire Acute Hospitals NHS Trust said its procedures had changed. Twin pregnancies were now routinely scanned from 16 weeks' gestation, rather than at 24 weeks, it said. Ms Bate's solicitor, Guy Forster, said the syndrome, which only affects twin pregnancies where both babies share a placenta, has a survival rate of at least 70% if detected and treated early. Mr Forster, of Irwin Mitchell, said as well as not carrying out a 16-week scan the hospital missed other opportunities to diagnose the condition. These included two occasions in May 2005, when Ms Bate, from Kidderminster, was 20 weeks into her pregnancy. She attended hospital with severe back and abdominal pain but was diagnosed with a urinary infection and sent home, he said. Mr Forster said: "In all likelihood both of Stella's twin girls would have survived had she received proper care. "The trust's change in procedure for routine scans comes too late for Stella, however, it is hoped that future tragedies can be prevented." John Rostill, trust chief executive, apologised and said he "accepted it was possible that the babies could have survived". "There is clear evidence that from 2007 we have routinely scanned appropriately," he added.